Mystery Photo No. 13 is an FAA Museum image. 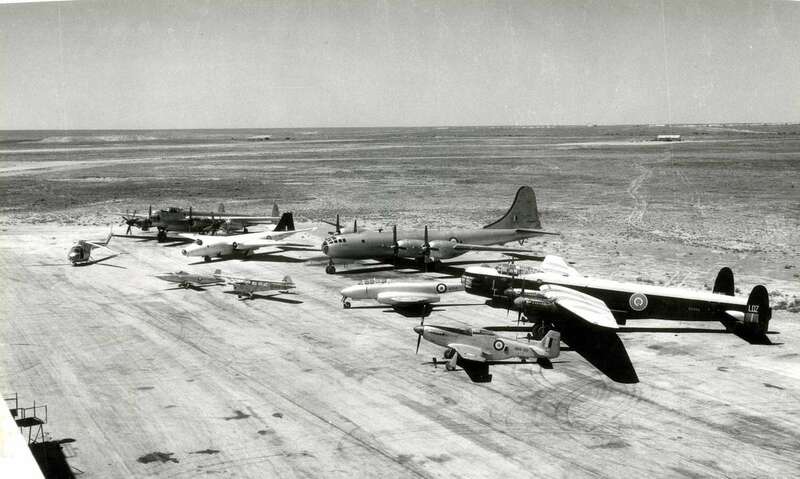 From left to right, what are the nine aircraft types in the photograph? This Mystery Photograph attracted a lot of attention and I received (mostly) correct answers from Ken Vote, Peter Adams, Richard Kenderdine and Greg Kelson. Richard Kenderdine and Kastytis Grigonis (is that a pseudonym?) provided some additional details for which we are grateful. Kim Dunstan, in his inimitable way, also provided detailed information, as did that excellent site ADF Serials. Bristol Sycamore A91-1. This aircraft was used almost exclusively at Woomera from Sept 51 until 1965. Avro Lincoln. This aircraft was fitted with Armstrong Siddeley Python turboprop engines in the two outer nacelles (the same power plant as the Westland Wyvern). The expert consensus is that this aircraft is likely to be RF403 as it has cut-down cowlings. The aircraft was used at Woomera to ferry the Blue Danube Atomic Weapon (amongst other things), and the Pythons gave extra performance to enable high altitude operations. English Electric Canberra A84-2 used at Woomera 1952. This may have been used in pilotless aircraft trials. Boeing B29 Superfortress WW354 (known as the “Washington” by the RAAF). 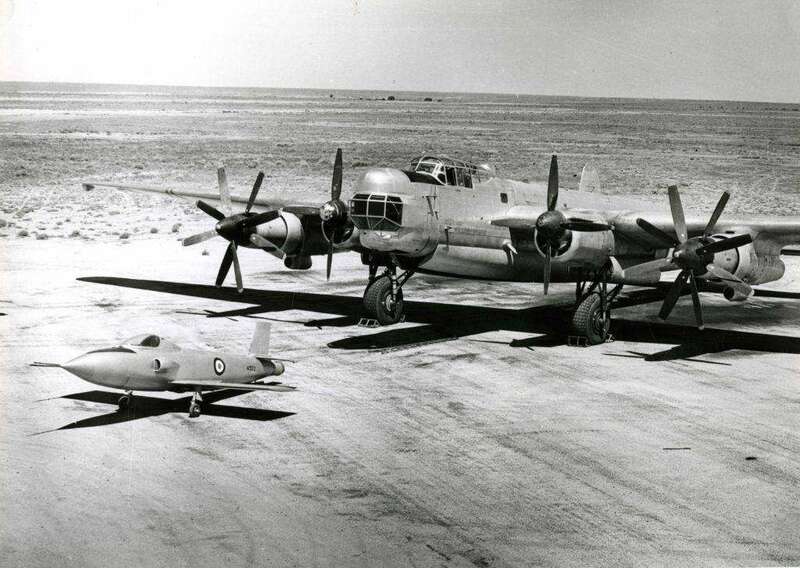 Two such aircraft were transferred to the RAAF for use by ARDU in 1952 for UK Ministry of Supply trials. Both retired in 1956 and were scrapped the following year. Avro Lincoln RAAF RA644. This was formerly a RAF aircraft but transferred to the RAAF. Known to have operated at Woomera 1951 and destroyed in October 1953. CAC Mustang XXII A68-190. No details except undercarriage collapse at Woomera 8 Oct 1953. Gloster Meteor T7 A77-2. No details except crashed Evatt Field 28/09/1956. GAF Pika A93-2. This was the piloted version of the “Jindivik” target drone. Only two piloted versions were ever produced and the aircraft in the photo was the only one to survive. For more info on the Pika (and Jindivick) click here. Here is a closer image of the Pika in the foreground and the RF403 (Lincoln) in the background. The Pythons with contra-rotating props can be clearly seen.